Thirty years ago The Cosby Show changed what was possible if you were black and on television, that you didn’t have to play to type and there truly was a universality of the human experience. You could finally be anything—a doctor, a lawyer, a homeboy in outer space. With the right talent and support, any TV dream could come true. But was everyone up to the “challenge”? In the time of “B.C.”—before Cosby—the most influential form of the black sitcom came from our racist past, radio’s Amos ’n’ Andy. A minstrel show, later turned into a TV show starring black actors, set the stage for what was expected of black people on television: that whether dressed up or dressed down, there needed to be some sassy, hambone talk, and you needed to be 10 seconds out of the cotton patch, struggling in the big city. With that, you eventually get Sanford and Son and Norman Lear’s Good Times—both of which were of the “jive talking” variety of working-class struggle and strife. It wasn’t that all these shows were bad, but they all had their distant roots in the minstrel mold. Even the outliers—like The Jeffersons, who finally “got a piece of the pie”—were more of a bawdy, parodic absurdity than any peek into what the lives of the black upper class looked like. There seemed to be a limit to what people expected of African Americans on television. For every Julia, there was a multitude of That’s My Mama. But The Cosby Show was different. It was decidedly well educated but still authentically rooted in the African-American experience. And it was about a family, fitting in with Cosby’s interest in education and children, highlighted in his Fatherhood book in 1987. Running for eight seasons and in the top five for seven of those seasons, it is only one of three programs that have ever consecutively been the No. 1 show on television for five straight seasons. (The other two are All in the Family and American Idol.) In the modern era, in which a cable show is a “hit” if it garners 3 million viewers, The Cosby Show regularly drew more than 20 million households every Thursday night. The Cosby Show had so much power and made so much money that it made Bill Cosby influential enough at NBC that he managed to get a TV show about a fictitious historically black college on the air. A Different World ran for seven seasons and is considered by some to be the greatest black sitcom ever made, even more so than the juggernaut, The Cosby Show. In Cosby’s wake came several black family sitcoms, popular throughout the 1990s into the early 2000s. The shows were of hit-or-miss quality as executives took elements of The Cosby Show (and A Different World) and tried to build a new Cosby: Black middle- and upper-class characters. Romantic Dwayne and Whitley-esque coupledom. Black professionals. Black families with kids. 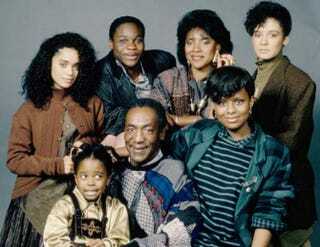 Black family characters dominated by daughters (Theo was the only son to Cosby’s four TV daughters). Overdone song-and-dance numbers. If you squint hard enough, you can even see its diluted essence in reality-TV offerings like Run’s House. Even the new sitcom Black-ish on ABC (set to debut Sept. 24) has that Cosby-esque sheen of being about an upper-middle-class family, but now about one existing in a mostly white suburb. Most of the time the networks ended up with something OK, but there was this element of disrespect: They failed to acknowledge that The Cosby Show had been created by a comedic genius, was smart, had outstanding writing and featured a gorgeous Broadway actress playing the wife, along with a host of talented, adorable children. While the copying could be hackneyed, it was a true shift. Black sitcoms became more aspirational. Black TV families became more complex. The influence of Amos ’n’ Andy was officially dead, and Cosby had killed it. There was finally a new model of black TV success. For all this effort, though, the success of The Cosby Show—like Michael Jackson’s Thriller, Seinfeld and legendary newsman Walter Cronkite—is unlikely to be surpassed, not because other good shows won’t come along but because our media market has changed so drastically that it’s not possible for any one thing to dominate American culture the way The Cosby Show did. There are too many networks, too many websites and too many options for viewers. Because of this rarity—a cultural icon uniting all—The Cosby Show will continue to be celebrated. It was that rarest of things: something that almost everyone seemed to like, and coincidentally, it just happened to star African Americans. It’s a shining example of exceptionalism that, at its essence, even explains why reality shows like T.I. & Tiny: The Family Hustle are on the air. Every black sitcom, even if it’s a reality sitcom, is kind of The Cosby Show in its own demented way. Vote for the Greatest Black TV Show ever.